The Bath Half Marathon is one of the longest established and most popular city centre road events in the UK, and returns this year on Sunday 12th March 2017. Commencing at 11am, It is the largest charity fundraising event in the South West region, raising over £2.1 million for charity in 2015. Due to the size of the event, severe road closures will be in place. Whilst the race is underway, the A4 Air Decker will start and terminate at The Globe roundabout, and will be unable to serve all stops along Newbridge Road and the city centre. Bath to Bristol Airport – All departures up to 09:00hrs will operate as normal. The 09:00hrs Air Decker will be the LAST bus to depart from Bath city centre. The 09:30hrs Air Decker and all services after this will depart from The Globe. Normal service will resume once the marathon has finished and roads reopen. This is anticipated to be mid/ late afternoon. Bristol Airport to Bath – All departures up to 07:30hrs will operate as normal. The 07:30hrs Air Decker will be the LAST bus to depart from Bristol Airport and terminate in Bath City Centre. The 08:00hrs Air Decker and all service after this will terminate at The Globe. Normal service will resume once the marathon has finished and roads reopen. This is anticipated to be mid/ late afternoon. Passengers wishing to travel into Bath City Centre once the race is underway are advised to alight at Keynsham, and board a train to complete their journey. This entry was posted in Uncategorized on February 23, 2017 by Victoria. Due to roadworks being carried out on Bath Hill, Keynsham Memorial Park bus stop will be closed from Tuesday 14th February 2017 until Friday 3rd March 2017. Passengers that normally board at this stop are advised to board at either Keynsham Church (High Street) or The Talbot. This entry was posted in Uncategorized on February 14, 2017 by Victoria. The Bristol Airport forecourt will be closed on the 15th February 2017 between 07:30am and 10:00am. During this time the Air Decker Service will drop off as close to the Airport Terminal as possible. Bristol Airport staff will be available during this time to guide and assist passengers. Should you require any further information please do not hesitate to contact us at hq@bathbuscompany.com or 01225330444 / 01225444102. This entry was posted in Uncategorized on February 13, 2017 by Connor Flavell. The A4 Bath Road, Saltford from it’s junction with Manor Road to it’s junction with Beech Road will be closed for 5 nights from Monday, 13th February 2017 until Friday, 17th February 2017 between 20:00 and 06:00 in both directions. From the A4 Bath Road the Air Decker will turn left on Rodney Road, then right onto Uplands Road, then right onto Golf Club Lane, then right onto Manor Road then left onto Claverton Road which joins onto Claverton Road West, then right onto Grange Road and then finally left to re-join the A4 Bath Road. From the A4 Bath Road the Air Decker will turn right onto Grange Road then left onto Claverton Road West which joins onto Claverton Road, then right onto Manor Road then left onto Golf Club Lane then left onto Uplands Road, then left onto Rodney Road then finally right to re-join the A4 Bath Road. There will be a temporary bus stop serving both sides of the A4 Bath Road just before the junction of Grange Road and before the junction of Rodney Road. This entry was posted in Uncategorized on February 8, 2017 by Connor Flavell. Dorchester Street will be closed with it’s junction with Manvers Street (opposite the railway station) for one night Wednesday 8th February between 19:00 & 06:00. During this time the A4 Air Decker Service will not be able to serve the Dorchester Street bus stop outside of Debenhams, opposite the railway station, or the Terrace Walk bus stop. 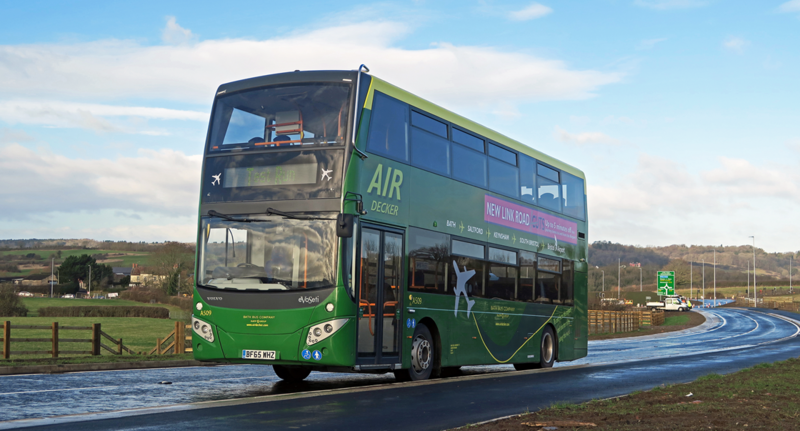 The A4 Air Decker Service will instead turn around via the Bath Bus Station and use bay number one, outside of the Bus Station as it’s start and finish point in Bath during the night of the 8th. This entry was posted in Uncategorized on February 2, 2017 by Connor Flavell.